"A Better Start For Young Minds"
We have established and will maintain a professional culture of high academic achievement through the use of a well designed educational curriculum. Our curriculum was designed to give your child a smart start to their cognitive, social, and emotional development. The Core Knowledge Sequence program is used to help develop the child through movement, oral language, nursery rhymes, scientific reasoning, math and visual arts. A academic curriculum, with special programs to prepare children for school. An encourageing, disciplined and safe academic environment. A level learning to fit the child's individual needs. Flexible hours to meet the needs for family work hours. SRLA provides a safe and nurturing environment for all children. Foster maximum growth for each child. 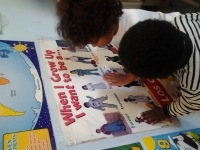 Develop social, emotional, physical and conitive skills at the appropriate developmental level. Provide opportunities that will engage parents in the teaching and learning.